I work long hours and have a lot of pain in my feet, legs and lower back. Basically, I hurt all over! I wear insoles in my shoes (not custom), and take ibuprofen for the pain. Does anyone know how to manage my pain without so much over the counter medicine? Quitting my job is not an option. I am very sorry about your situation! It is terrible. Ideally, you and your co-workers would be able to get together in a union and make some changes (depending on what type of job it is, and what is causing the pain other than simply the hours), but I know this is hard, and you would need to take care of your back, legs, and feet regardless. 1. Wear good, supportive shoes or boots. They should fit perfectly, feel comfortable, and have thick rubber soles without high heels. Unless you need to wear steel toes for your job, avoid them, as they can be hard on your knees. If possible, alternate pairs of shoes from day to day. You need to let one pair air out before wearing them again. 3. Practice good posture. This will make a difference for your back. 4. Simply don't lift anything that is too heavy for you. It's not worth it, so don't risk it! 5. When you get home, try to elevate your legs and feet. Take off those socks I recommended so highly, and let your skin breathe. If you have actual swelling, alternate heat and cold. (For example, put a very warm--I would say hot but I don't mean you should burn yourself--washcloth on the swelling for a few minutes, and then switch to an ice pack.) If there is no swelling, just let someone give you a massage! It will feel great. Let them bring you a nice cup of herbal tea, too. You've earned it! 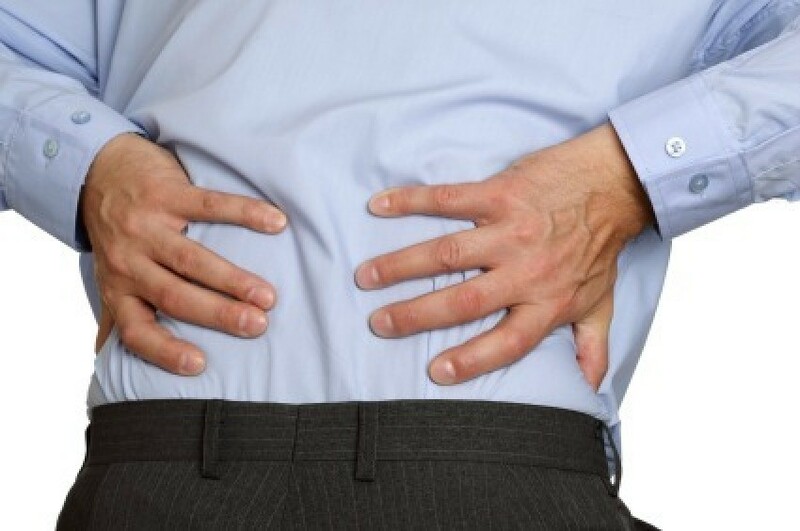 You may be suffering from sciatica. Go to a reputable chiropractor and, if diagnosed with sciatic pain, he will probably recommend that you apply an ice pack to your buttocks for 15 min. to relieve the pain. Sciatica will cause pain in one or both buttocks, legs, and feet, and it's aggravated by prolonged standing, bending, and/or squatting. In addition to these other great suggestions, here's some more. What you are needing is arch-support. When I wore dress shoes to work in a department store, I bought a couple pair of mens knee-high black support-socks to wear and they really helped. FEET-UP= Standing on our feet all day makes the blood 'pool' in our lower legs & by putting our feet up higher than our body, it helps it to UNpool. Lying flat on my back with feet high up on the wall, with arms stretched out to the side for half an hour helps me tremendously. SQUAT= with your armpits on your knees with your lower back rounded. Stay this way while it stretches your back muscles, then very slowly roll yourself up to standing, a friend taught me this & it really helps the back. SHOES= if you are wearing dress shoes, look at the sole to see the shape of it, if it curves inward toward the arch & heel area, DON'T wear them, they will KILL your feet. Make sure the sole is flat all the way across the bottom. They are a little harder to find but they are out there. Even if you have good arches in your feet, you need arch-support in your shoes & socks. SHOELACES= if you are wearing lace up shoes, loosen the shoestrings. Tie them loose enough you can slip them on & off without tying & untying. This is a tip a co-worker gave me when I worked in a factory, and he was right, it helps alot. SOAK= in a warm tub of epsom salts. One co-worker told me she soaks in a warm tub with Clorox in it to kill the pain in her legs! MOVE= keep stirring around to keep the blood circulating & muscles limber. I had the same problem. It was so bad I could hardly walk when I got home from work. I went to a very good foot doctor who molded the arches of my feet and gave me inserts for my shoes. As soon as I put them in I didn't have pain anymore! It worked great. They are a lot better than the ones in the stores. They are customized to fit your feet and give you the support you need. I did buy the custom made insoles for my shoes and wow!!! no more pain. My feet were so tired by the end of the day before. Now, no pain. I didn't realize until after I got my orthodics how tired and sore I had been before. I do like all the other ideas in the other posts. I often do the "chair position on the floor" after I have been working outside in the perennial and flower beds and gardens in the summer, to rest my back. I also find that a soak in our hottub and using the jets in there works as a massage when I am sore. A hot bath might work for yourself. I have pain also in the feet and legs.. Also a great deal of back pain. Have been taking shots for years now. Was told this was neuropathy and i have been taking neurontin for it. Finally MRI was done this week and they found trouble in my back. Looks like i may have a nerve block done. Do make yourself go to doctor and have x-rays done. Don't wait. Better to be sure than to hurt for years and not know. I, too, will have to suggest a good chiropractor. My chiropractor says a person's knees are the last to start hurting when the body is out of whack all over. I know my parents would rather die than go to a chiropractor, but I know how bad I felt after a fall on the job a few years back. I never in a million years thought someone could make me feel any better. I won't lie and say I'm 100% better from where I was before. As my lower back still bothers me from time to time. But the best advice I ever received in my whole life was "visit a good chiropractor". You'll see what I mean if you do the same. When you don't feel well, you can't do an employer a good job. If you have insurance, check to see if the chiropractor will accept that that kind. If not, see if you can work out a payment plan. Best of Luck to you. I feel for you! I also have heel, leg and back pain, mostly heel pain. I do not have insurance but have read all about it and probably have heel spurs. I have always needed good arch support, so I have always worn good shoes. But now, I have to use inserts. I have tried several different ones, and I always take them back and continue to use the 2 oz. Miracle insert, sold at Walmart. They only last 3-4 months, but they work the best for me. There are shoes out there called Z-Coil that cost close to $200 that alot of people wear and claim they are wonderful. Good luck! I am a cooking teacher and must stand on a concret floor while teaching 3-2 hour classes a day besides cleaning and class preperation. I have a herniated disk in my back, neropathy in my feet legs, hips and back. I must keep working but suffer great pain which I am told will keep getting worse. I first went to a GOOD Nerologist and pediatrist. I had a full check up from both. I gave up trying to wear heals higher than two inches and then only once in a while never at work. Some people have problems with their feet and back that can be ajusted or made better by simple surgery. I don't have such luck and don't want to become dependant on heavy pain killers till my conditions get so bad that I must quit work. Several years ago I attended a pein clinic. I have made the following changes and use a form of modifyed yoga because I can't sit on floors or kneal on my kneas any longer. It is so important that you get medical advice. before changing anything or trying new items that might hurt you rather then help. I wear the best running shoes possable only til they begin to wear out. Usually I can get a good pair of Revock or nikes on a good sale. Do not scrimp on your feet. I have an hour in the morning and one in the late afternoon when I have arranged my work day so I can do sitting work. The Nerologist recommended that I purchase a well made, well padded adjustable chair that I can sit on when working with the clients so I am not on my feet so much. I got my employer to purchase an erganomically correct chair for my heighth and counter highth. It is well padded, has arm rests and I can scoot around the counter work stations to work with the clients as needed. I also use it at my desk which is much better than the one I had. some say that this was too expensive, but my sick leave is way down and I never use all of the pain medication I am prescribed. I also talked with the Nerologist about my desire not to become dependant on high doses of pain medication until the conditions got so bad that I had no other choice. She prescribed a timed released very low medication with another type of medication in a low dose for break through pain. I do take the timed release but rarely use the break through. medication. I am very greatful to have it though. I put music on the cd player or in the computer and turn off the office lights a few minutes before the first and second classes. Take off my shoes and sit quietly with the music going and visualize my favorite place to go. (a mountain stream, my favorite room in the house etc.) I do this three times a day and for one hour at night just before I go to sleep. At night I also burn my favorite scented candle. Scents can help your mood, I find vanilla and sea breeze are the best for me. Lastly, I lost sixty lbs. I have fought weight my entire life. I had to take a cordizone drug for a long time and gained sixty lbs. The nerologist orded a blood test for viteman b12. I was very low and suffered the side effects for as long as I can remember. You are supposed to have a level of 400 mine was 128. The nerologist began me on a shot a day for two weeks and then one every other day. In order to maintain my level I give myself a shot of b12 once a week. I have been doing this for almost five years now and have never felt better. I sleep better also. Go get a good physical from both a good Pediatrist and Nerologist before changing anything. You can change something and really cause serious damage to your self. You might also have Neropathy (damaged nerves This is not reversable but you can slow or stop the damage and the pain early if you get medical intervention. I have tried the z-coil shoes and you are only wasting your money for a gimmick. The insert they sell at wal-mart are the best for foot pain. RE: dealing with foot pain. I'm 42 year old female had been pretty active all my life, ow ever lately I have some of the health problems, I have under gone over 10 major abdomal surgeries before the age of thirty six this is to mention those, getting to the feet pain I know from experience that the feet pain I'm currently suffering from now, I may be in need of just a comfortable pair of socks. My feet pain was so bad that I ended up final going to the ER, it wasn't I decided to terminate the doctor that had been caring for me for past to years, that I realized that I had been neglected. throughout this past 6-months I was not aware of the findings until lately that the foot pain could more related to kidney problems.the first ER visit the Urinalysis/culture showed 50,000> 100,000 negative rods of bacteria. antibiotics given for ten days/ second ER. visit do to flank pain, foot pain bladder problems, Er doctor did not run a culture off the because the PH only dropped to a 6 I asked him why he never ran the culture any way I had informed the nurse when I came in that I just got over a severe infection. he said he didn't know this so I open my records that I had with me and showed him the last test findings. I said to him PH reading the lab got today doesn't mean that there is no possibility of a infection the test show PH 6 this is .5 off of the normal range. as he was looking at the past test he says I didn't know about your past infection. well there was no one to blame here the ER doctor actually would have ordered a culture if the PH had dropped to even 5.5 this how the medical decisions go. he realized at this point that I new better, so I said well doc you did your job you are making your decisions by what the lab results are. unfortunately i still have reoccurring foot pain, and probably will see a neurologist, i will do more research this issue. if you can send additional information besides what is on the website. No one seems to have mentioned having a rubber floor mat behind your feet to cushion the impact if at all possible...and when I did a lot of sales, I would wear especially "cushy" flat shoes" and rotate them daily - and then massage my feet with a foot roller to keep them supple. Put them up as much as you can on breaks, etc....You really have to work on your feet/legs, as we were never supposed to stand around for those long hours! My sore feet and how sore they were. Went to my sports medicine Chiropractor and found out that there were light tears in my tendons. However, the real problem was in the calves of my legs. He put me through stretching type manipulations and ultra sound on the heels of my feet and the majority of the pain is gone. That was 6 hours ago. I now have to put my feet in lukewarm water put in a tray of ice and let the water work its wonders. After this I am to use a golf ball which has been in the freezer for 6 hours, and roll my foot on that. Good chiropractors are a jewel.